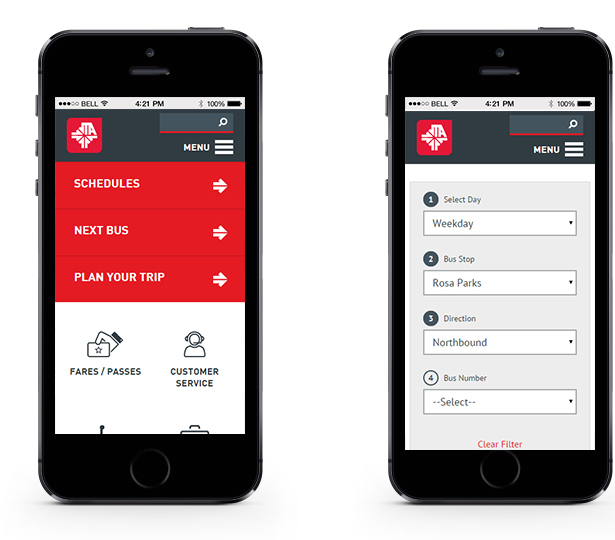 The Jacksonville Transportation Authority (JTA) entered into an ongoing partnership with Station Four to improve the web experience for their users with a larger focus on mobile. The first phase of improvements included an accelerated redesign of their current website, making it more modern, user friendly and responsive. To meet launch requirements set by JTA, phase 1 retained the current website’s code architecture, but contained the look and feel of a brand new site. Increased visibility for key navigation items, better organization and smoother functionalities throughout were some of the new design’s key elements. The organization and display of JTA bus schedules is one of the site’s primary functions. Through informal user testing and iterations, S4 took the existing backend structure of the schedules and reworked their organization and feel for a more intuitive experience on both desktop and mobile devices. Through user data, S4 found that while the site wasn’t mobile compatible, over 80% of users were accessing it through a mobile device. 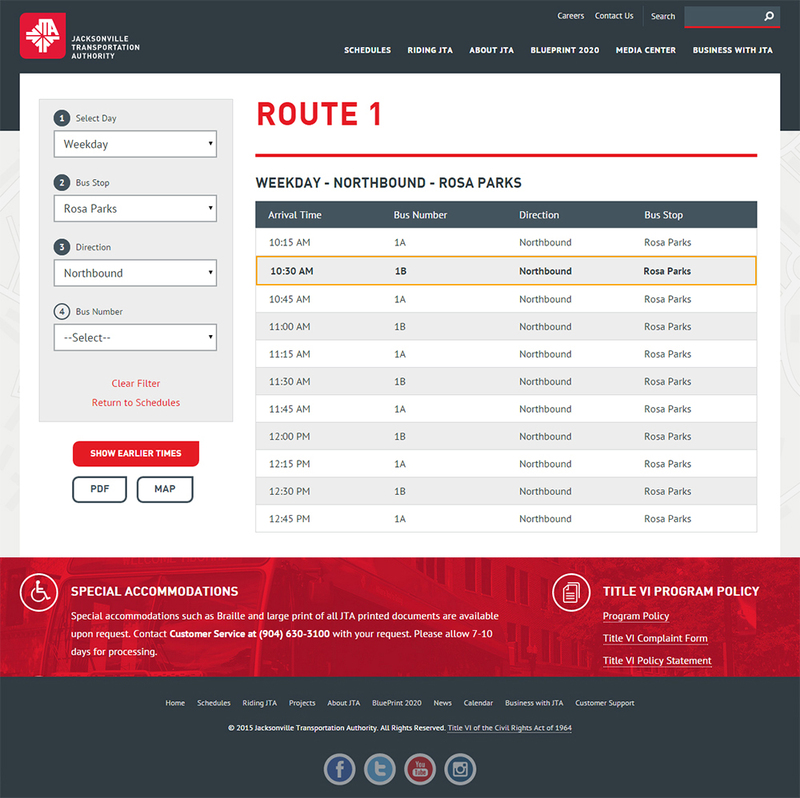 A major portion of Phase 1 was ensuring that the new design was responsive and accessible from any device. A secondary goal of phase 1 was to solidify JTA’s visual identity online. For years JTA has been raising the bar with its presence in print collateral and physical spaces. 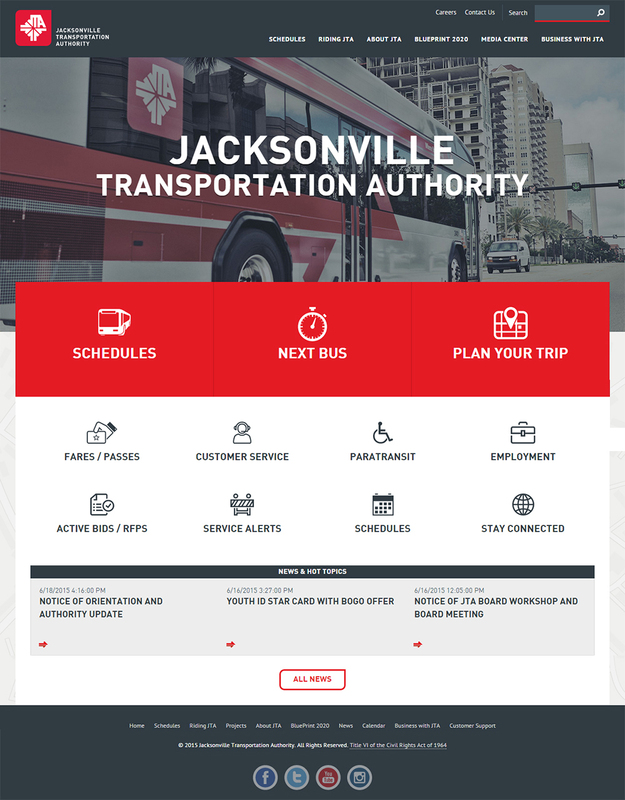 Along with being a more intuitive design, jtafla.com now carries all of the JTA’s visual identity, giving riders a more unified and positive experience.